The heart of Candelo has a new look and is ready for the busy, warmer months ahead. 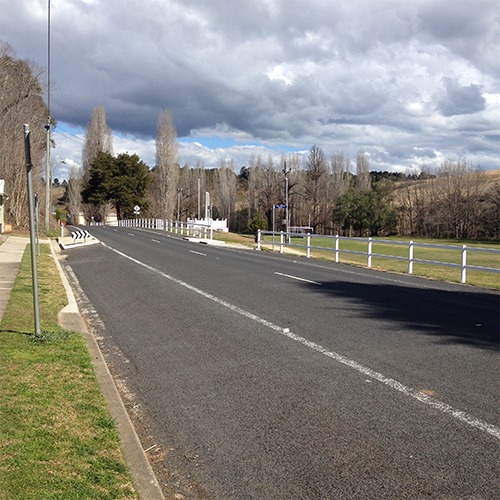 Bega Valley Shire Council has just installed a new fence at the Candelo Sportsground, along its boundary with William Street. The old white timber fence that was so much a part of the town was rotting and has been replaced with a similar looking structure made of white powder coated metal. It’s hard to spot the difference between the old and the new. Given the significance of the space in the centre of the village, Council consulted with a range of community organisations around the type of fence to be reinstated and where. The Candelo Rural Fire Service, the Candelo Market Committee, the Candelo sub-branch of the Returned and Services League as well as local businesses, have all been part of the process. “We also saw an opportunity to improve vehicular and pedestrian access in and out of Candelo’s much loved and used recreational space,” Council’s Recreation Assets Officer, John Turville said. Coupled with the refurbishment of the fence along William Street, car parking and appropriate line marking has made life a lot easier for people, especially passengers, getting in and out of their cars on the sports ground side of the road. “We really hope these improvements will add to the experience of locals and visitors alike in this popular and picturesque village,” Mr Turville said. Any queries regarding the installation of the fence at Candelo Sportsground should be directed to Council’s Leisure and Recreation Officer, John Turville, on 0427 570 599. Photograph: Candelo’s new metal fence, replacing the timber one that was rotting.